The fourth installment of what determines the location of a capital. The case study of Delhi, India. 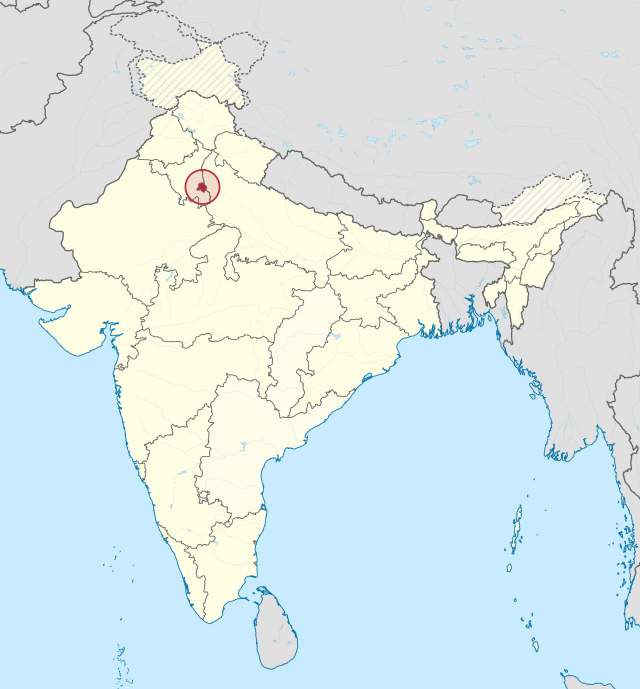 Looking at a map of India, I have realized anew that its capital, Delhi, with a population of around 11 million being the second largest city after Mumbai, is located far inland and even further to the north. It is as if it was simply one of the provincial capitals (in fact, much closer to the Himalayas in the north than to Mumbai (to the south) or Kolkata (to the east), the third largest city). Let’s look into history to find out why and how Delhi became and evolved as the capital of India; the country is well known as the birth place of the ancient Indus civilization and also the cradle of eastern religious and philosophical development, such as Hinduism, Buddhism, Jainism, finding the concept of numerical zero and more. India with a population of more than 12 billion is said to be the world’s biggest democratic nation. It was the Mauryan Empire (317 -180 B.C.) that managed to unify the whole country for the first time. They built their capital in present Patna (about 900 km west of Delhi) because of its geographical advantage being the confluence of the Ganges and its tributaries. The Gupta Empire (320 – 550 AD) unified northern India and had its capital also at Patna. Thereafter, various Islamic dynasties ruled northern India, some established their capitals in present Delhi, the location of which was more or less in the center of their empires that included most of present Pakistan and sometimes even parts of Afghanistan. The Mughal Empire (1526-1858) was the last Islamic dynasty, which chose its capital, interestingly enough, in Delhi or Agra (almost 200 km south of Delhi) depending on which king was in power. Then European imperialists took advantage of the waning Mughal Empire and established their strongholds here and there. Eventually, India was totally colonized by the British in the 19th Century. So, did Delhi become their main city straight away? Not exactly. The British first established their stronghold in present Kolkata (previously Calcutta) when the East India Company (the vanguard of the British imperialistic expansion in India) set up its trading house there in 1690. But realizing the location of Kolkata was too offset to the east, the British administrators finally decided to transfer their colonial government to Delhi in 1911. Just less than four decades on, India managed to gain its independence in 1947, and Delhi became its capital. As we have seen, there was historical and geographical inevitability as to the location of Delhi. It is not too offset to the north after all, taking into consideration “greater India” that stretched further to the west and east than present India. Before ending this essay, I would like to explain two examples of the relationship between Japan and India in olden days. In 736, an Indian Buddhist monk, Bodhisena, came to Japan and preached Buddhism until his death in 760. Centuries later, some Japanese Christians fled Japan, which enforced the persecution of Christianity, and they settled at Goa, a Portuguese stronghold on the west coast of India, setting up a small community. Photos of Delhi from Wikipedia.